MS Adriatic Sun often sails between the islands and the shore, affording spectacular views and memories that will stay with you for a lifetime.With so few fellow travellers a ‘select’ atmosphere soon prevails as you gather in the convivial surroundings of the bar or up on the sun deck for a nightcap. The friendly, attentive yet unobtrusive staff attend to your every need as if you owned the vessel yourself – that’s how relaxed it is on this unique type of cruise. Enjoy spectacular coastal views whilst reclining on a sun lounger or hammock on the ample Sun Deck. Below you will find the Salon Deck with the elegant restaurant and bar, beautifully furnished and fully airconditioned for your comfort. Each day begins with an excellent breakfast on board with a selection of hot and cold options. On certain days lunch or dinner is prepared on board, specialising in mouth-watering local menus, hot meat or fish dishes through to freshly prepared salads, all delivered with a beaming smile.No cruise is complete without the Captain’s Dinner of course and you will enjoy a delicious selection of the best of Croatian and Mediterranean cuisine. If you wish you can dine al fresco on the shaded decks. There is no ‘seating plan’; you choose your own table and dining companions. Lunch on a sun-bed – no problem! On certain days you will be free to enjoy lunch or dinner at leisure giving you the opportunity to sample some of the delightful local restaurants ashore.Every evening the ships remain moored so you can take an after dinner stroll off the vessel, exploring these fascinating unspoilt ports. After just a few days of this extraordinary experience you will be on first-name terms with the ship’s company and most of your fellow guests. There is little formality – shorts and t-shirts are the order of the day. This is exactly how holidays should be! You’ll arrive at the airport to take your flight to the Dalmatian capital, Split. 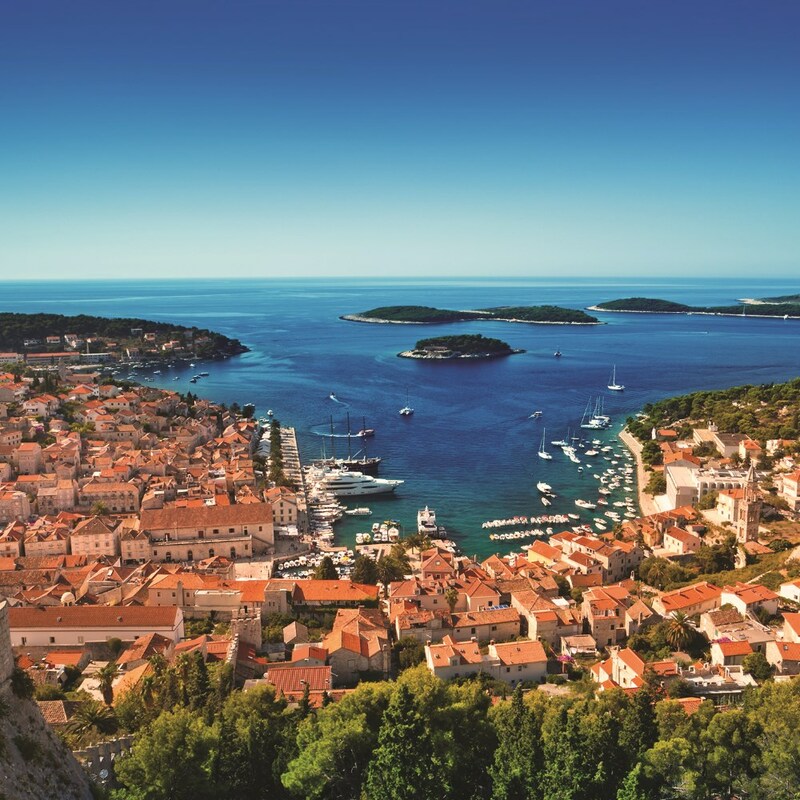 On arrival in this historic city, you will be escorted to the harbour and the superb four-star MS Adriatic Sun, your home for the next seven nights. The captain and crew will be on hand to welcome you and then, having settled into your comfortable cabin and surroundings, our adventure begins! For the rest of the day it’s time to relax and get to know your fellow passengers – there are just thirty-nine of you in total! Perhaps you’ll catch some ‘rays’ on the sun deck or take a stroll ashore. This evening, we have an informal gathering with your tour manager and fellow travellers before enjoying a welcome dinner in the ship's restaurant. Perhaps later take an after-dinner stroll ashore in this most magical of cities. As you rise refreshed in the morning and enjoy a leisurely breakfast, you’ll be so glad you chose this holiday. The MS Adriatic Sun, our home for the next week and every inch the private yacht, slips out of the harbour and out to sea. Split soon fades into the distance but we will of course return at the end of our cruise. It is impossible for large cruise liners to visit the charming and almost deserted hamlets accessible to our smaller yacht cruiser. 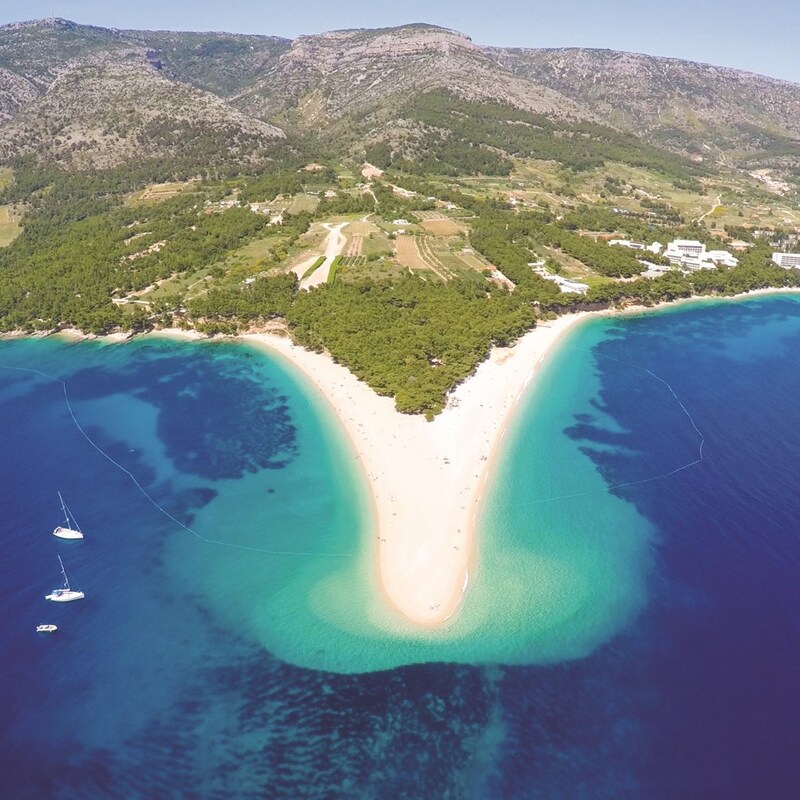 We will have time for a swim stop this morning before enjoying a delicious lunch on board, as stunning views of this spectacular coastline drift by and it’s not long before we arrive into the historic town of Korcula. Ruled by the Venetians for 800 years, it is rather reminiscent of a much smaller Dubrovnik, with its host of tangled lanes so typical of medieval Mediterranean ports. The town is a charming small fortress, celebrated for supplying timber for the wooden walls of Venice and its harbour was a major shelter for the Venetian fleet. You’ll find architectural gems at every turn in its narrow cobbled streets. Famous for its artistic and musical traditions, Korcula has its own unique sword dance, the ‘moreska’, and a form of a-capella singing, but is much more famous as the birthplace of the explorer Marco Polo. His house can still be visited, as can the All Saints museum with its glorious collection of Byzantine icons. This morning we go ashore to enjoy a tour of the stunning national park with a visit to the tiny islet of St Mary’s with its 12th-century former Benedictine monastery. With its colourful walls and alter carved from local stone you will already feel a long way from home in this most atmospheric of places – it’s easy to see why legend has it that the Greek hero Ulysses came here to contemplate. 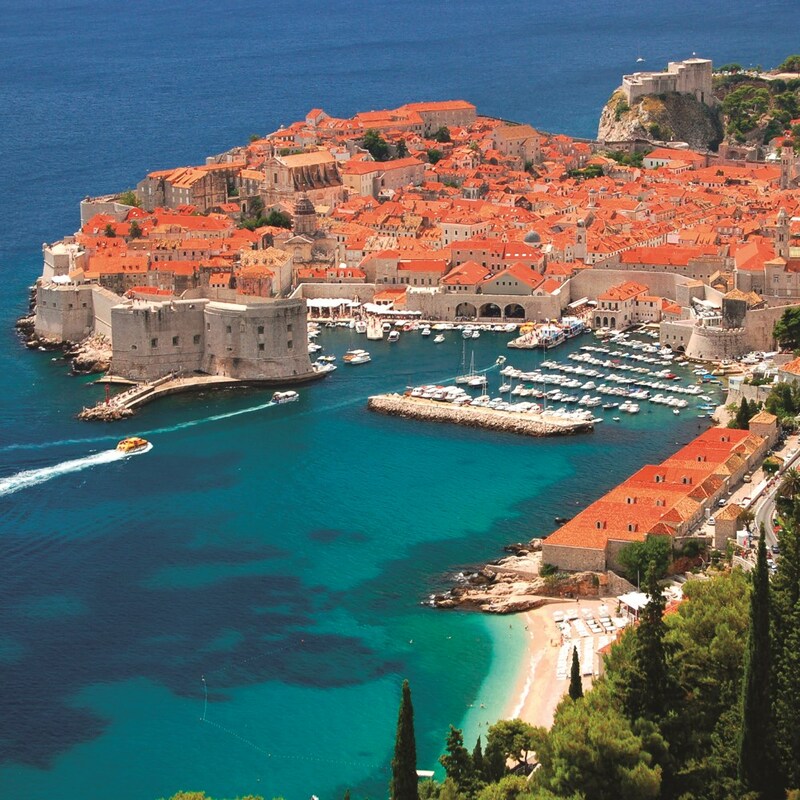 After lunch on board, there will be the opportunity for a swim, then sit back, relax and enjoy the spectacular views as we cruise into the magical city of Dubrovnik. During tonight’s dinner the ship will cruise alongside the ancient city walls before dropping anchor. Awaking in this most magical of cities, after breakfast we take a guided tour of the old town, an independent city-state for much of its history, it has evolved differently to the rest of Croatia. The city threw off its Venetian shackles during medieval times founding a commercial empire trading with the eastern Mediterranean, France, Spain and later the Ottoman Empire. As so often happened, the city began to reflect its resultant wealth and today this wonderfully Baroque city proudly nestles behind its huge imposing ramparts in a situation of outstanding natural beauty. The main avenue, lined by intimate cafés, is completely paved with gleaming marble, which dazzles in the sunlight and gives credence to the city’s description as the ‘Pearl of the Adriatic’. Throughout the city you will find a wonderful array of monasteries, beautifully decorated churches and civic buildings dating from the 14th century. After breakfast, you can take to the deck to see the spectacular coastland sliding by as this morning we cruise northwards. There will also be the opportunity for a swim stop here in one of the world’s most beautiful stretches of water. We lunch on board before disembarking this afternoon into the delightful and bewitching little town of Hvar in this enchanting archipelago. Wandering here is pure joy and remarkably, it’s so compact and cosy, the streets don’t even have names. 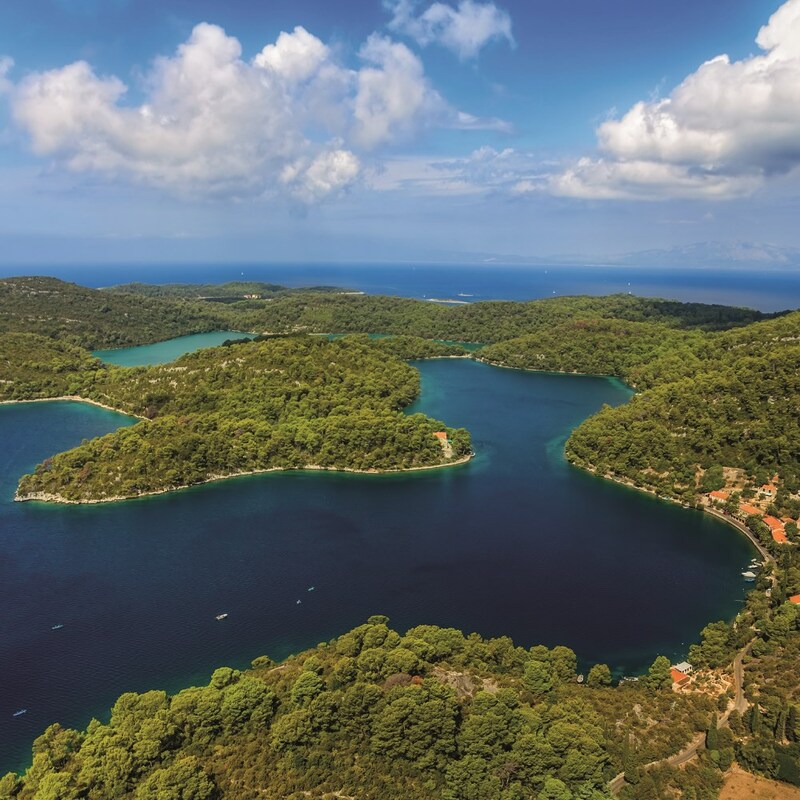 With its fresh water springs, the island is unusually green, its hillsides boasting spectacular pine forests. Elsewhere you’ll find olive groves, orchards and vineyards, the aromatic pleasures of the island exemplified by the delicate fragrance of abundant lavender fields. Hvar has been inhabited since Neolithic times; later, the ancient Greeks founded a colony here, and during the 14th century, as the Venetian Empire extended its influence, it became a major naval base. Also on the island’s northern shores are some distinctive fortified 16th century buildings, built to repel pirates and assaults by the Ottoman Empire. After exploring Hvar’s agricultural, historical and cultural splendours on our guided walking tour, dine at leisure where you wish. The ship remains moored on the island overnight. 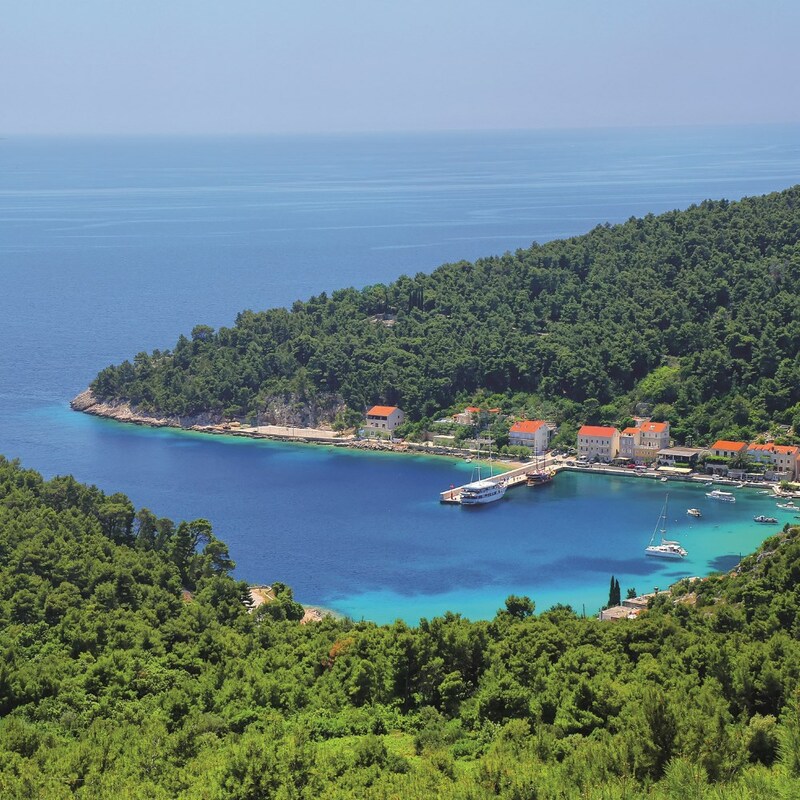 This morning’s cruise brings us to Brac, the largest of the islands on this dramatic stretch of coastland; a typically Mediterranean landscape where its spectacular beaches give way to high pine forested uplands, and where a rich harvest of vines, olives and orange trees crowd the fertile valleys. Once dependent on its grape harvest, the island also relied heavily on the export of its stone – a mixture of marble and limestone – used in the construction of Diocletian’s Palace but also of buildings as diverse as the White House in Washington to Berlin’s Reichstag and closer to home, the high altar in Liverpool’s cathedral. We head to the picturesque town of Bol and you might like to take the opportunity for a swim from the stunning beach. 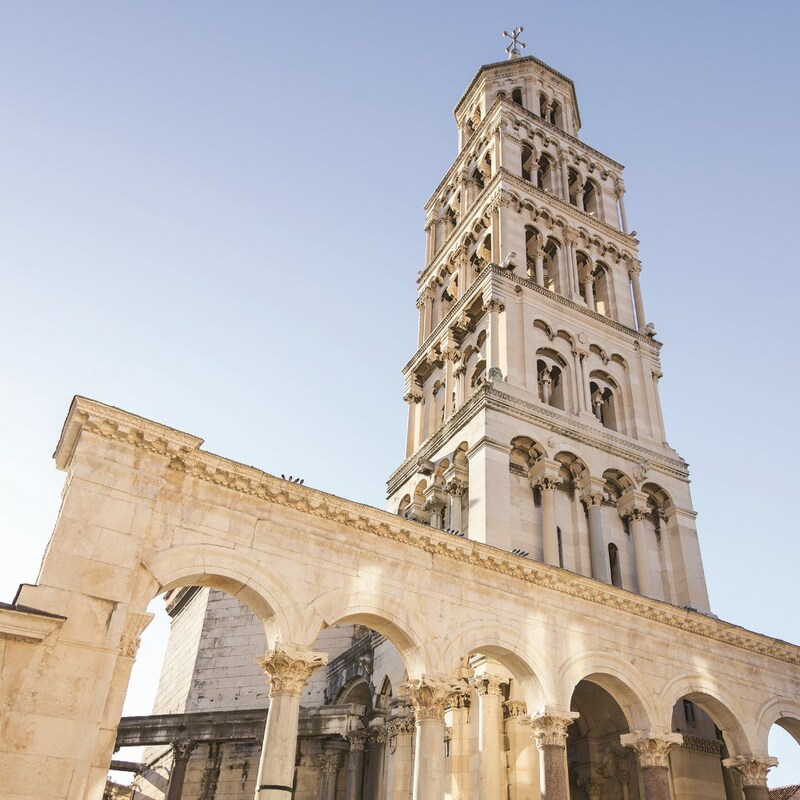 During lunch back on board we cruise back into historic Split, principally famous for a single building, the Emperor Diocletian’s huge palace, one of the greatest structures of the Roman Empire. No expense was spared in its construction - the best Italian marble, with columns and sphinxes from Egypt. But what makes this palace so astonishing is that during medieval times it was fully integrated into the town’s fabric with a jumble of buildings grafted onto and inside it. This means, for example, the temple of Jupiter became a baptistry. It’s all the more fascinating that today 3,000 people still live here. You will find surprises at every turn: there are tall medieval buildings lining the streets, but buttressed by unmistakably Roman columns! We have a guided walking tour of this fascinating complex which has recently been used as the setting of the TV spectacular ‘Game of Thrones’. 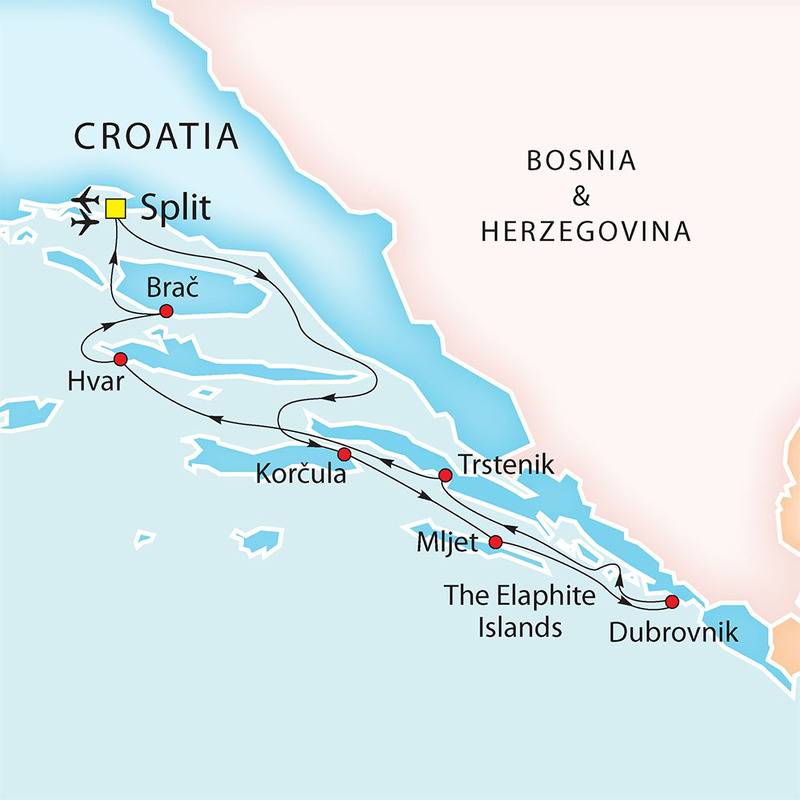 By the time you have breathed in the atmosphere and history of this glorious part of the coast, it’s time to relax back on board as the Chef presents the Captain’s Dinner – a delicious selection of Croatian and Mediterranean specialities. Later the bar awaits for a digestif and the chance to reflect on treasured memories of this wonderful journey with newly made friends. The price of this holiday is per person, based on one person in a double/twin room for sole occupancy. 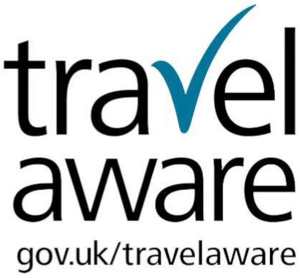 The price includes return flights to Split, all transfers, breakfast, five lunches, three dinners and captain’s dinner, tours and visits as per the itinerary and port taxes. In the event of unsatisfactory weather conditions the MS Adriatic Sun reserves the right to alter or reschedule the itinerary. Due to the size of the yacht, there is no lift between decks; therefore a reasonable degree of mobility is required to negotiate the stairs and overall design.